Although mostly a folk musician, I have always been interested in cross-over styles and this collection is the result of that interest. I had been singing most of these songs solo for a dozen years or more, but the album was a new direction – multi-tracking in a studio instead of my usual mode – standing in front of an audience (or a microphone) with a banjo. The Willy Ruby album was unplanned – it just happened! In August 2010, I was in Cavan for the All-Ireland Fleadh Cheoil, and met up with Johno Leader, Hannah Flynn and Jacob McCauley. We first played together at Johno’s Beast Studios, at Colleenmore near Loch Gowna, and recorded the album in about 10 days. Before and after the recording sessions we played at a dozen or more venues around Counties Cavan, Leitrim and Longford, guided by our energetic minder, Paddy O’Rourke, and in spite of the candle burning bright at both ends, the energy and spirit of the Fleadh kept us rocking. The banjo and the bagpipes are both drone instruments, using natural harmonics rather than the tempered musical scales found in most mainstream music, and the sound of the drones was a starting point for this album. I use the constant plucking of the 5th string of the banjo, the sustained drones of the bagpipes and an electronic Tanbur drone from North India, and these sounds keep the album rooted in folk music. On top of the drones, I use lots of percussion. The Appalachian clawhammer banjo style lends itself to syncopation and off-beats, and Jacob’s virtuoso bodhran style, combined with Johno’s mastery of the sounds of the drum kit and tabla, (to say nothing of the mixing desk) matched the percussive character of the frailing 5-string. Johno’s ear for harmonies and Hannah’s sweet and confident vocals glued the whole thing together. 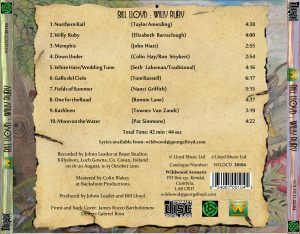 So this collection is a mixture of styles, from reggae and bluegrass to pop and rock, with a folk and country theme running through it, held together by the vocals and the frailing banjo. James Bartholomew Rocco, an Irish surrealist painter. Originally a Dubliner, he lived in England before returning to County Cavan, where he died tragically too soon. A great loss. Bill Lloyd. See separate ‘About’ Page. Johno Leader is a multi-instrumentalist, engineer and producer who works out of his studio near Dring, in County Longford. As well as his studio work, he plays with 5 piece Alternative Indie Retro Synth Rock Ape Rising and hosts a music radio show on Cavan Community Radio. Jacob McCauley is an award-winning bodhran player, a member of Celtic bands “Fig For A Kiss” and “WhirlyGig” and an active session musician recording and touring artist. He has shared the stage with “The Chieftains”, and “Lau”, among others. Jacob is an experienced instructor, and currently working on his first bodhran Instructional DVD. Hannah Flynn lives in Cumbria, where she sings in sessions and folk music venues, both solo, and with Paddy Rogan. This is her first album – watch this space! 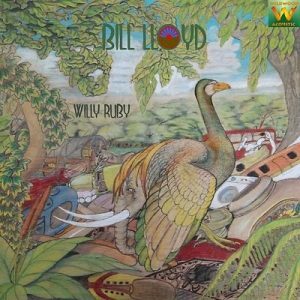 There is a famous Bill Lloyd, (Nashville alternative pop-rock) and another one. I am not the famous Bill Lloyd, but iTunes persists in attributing my music to that one.